Ever on the search for the one perfect fragrance -- which, truth be told, I find to be darn near impossible -- I've sampled more perfumes than I can even count trying to find that one that truly completes me. 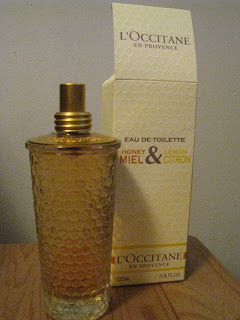 But I have to say that I was extremely happy when I recently discovered L'Occitane Honey & Lemon Eau de Toilette. I'm a huge fan of both tart and sweet, and this fragrance seems to have found the perfect balance between the two. Citrusy lemon combines with delectable honey, vanilla and caramel notes to create an absolutely intoxicating aroma. And the bottle, oh, the bottle! The intricate carved honeycomb pattern and the delicately slender shape make me long for a proper vanity with mirrored trays of gleaming silver so that I can display it properly. The end result is utterly delicious without being too cloying or overpowering. So have I found my new signature fragrance? Absolutely.